CYO/Camp Howard started a new fundraising dinner last September called the CYO Champions of Faith Benefit Dinner for CYO/Camp Howard. Joey Harrington was our first guest speaker and 700 people paid to attend the event at the Oregon Convention Center. It was a thrilling evening and CYO/Camp Howard netted $100,000.00. The money was used for scholarships for CYO and Camp Howard, Endowment and camp facility improvement. As a matter of fact, this is the money we are using to heat the pool! We have scheduled our next Champions of Faith Dinner to be held October 2, 2012 at the Oregon Convention Center in the Oregon Ballroom. Karen Gaffney, former CYO swimmer will be our guest speaker this year. Karen is a motivational speaker who has a fantastic story to tell which is guaranteed to move the entire room. We look forward to sharing Karen with our guests. Readers, what do you think? I want to hear from you as you click-through the blog! Thank you! 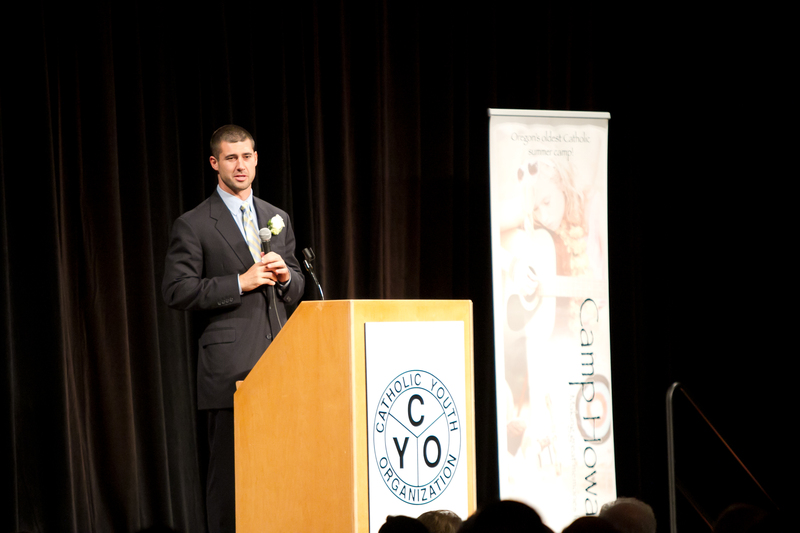 Below: Joey Harrington delivers his motivational talk to the audience September 27, 2011.